Project Merlot wins a trophy! On Sunday 20 May Project Merlot took on all comers and came away with first place in its first competitive event!! 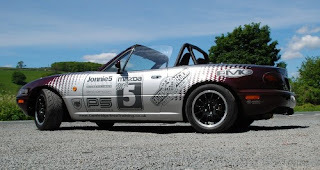 In its new livery the car was a last minute entry in the MX-5 Owners Club Spring Rally Hot 5 competition. The car drew loads of attention from club members and the general public at the event held at Beamish Museum in County Durham. Several people were heard to say on first sight such things as “hey, that’s the car form the club magazine we have been reading about”, proving that the cars fame is spreading. Following the voting by club members the Merlot was declared the winner and co-owner Robbie Marsh was presented with a trophy. It was a proud day for Team Merlot and all those involved. It was the forth time Project Merlot had been driven hard on a track, and since the burst heater hose escapade at Donnington Park on its first outing the car has taken all we have thrown at it without any rebuke. Would the day at Woodbridge Airfield with Javelin Trackdays prove to be the end of this perfect reputation? Martin Curtis and I arrived at Woodbridge at 8:30am after an “it’s going to be one of those days” journey to the venue. After me locking the keys in the boot at the filling station (Martin had his spare), overflowing the tank and loosing a good few quids worth of petrol on the floor, Martin having to drive back home to get some polish then when we did arrive at the gates of the Airfield the Marshall had Mrs Curtis’s name on the driver list, a recurring theme at track days now! We carried out the usual routine of removing number plates & items from the boot, setting the tyre pressures, checking the levels and giving the car a quick shine up. At 9:30 we were called to sign on and attend the driver briefing. Now accompanied by fellow drivers for the day Ken Ward (Track day veteran) & Neil Barber (Track day virgin), we listened, shivering to the very specific instruction given out by the Javelin Track Days owner and the head Marshall (who must have the neatest facial hair in the northern hemisphere). At 10:00am the first group of 15 cars went out to do 3 sighting laps of the circuit followed about 6 minutes later by the second group of 15 cars which included Project Merlot. After the sighting lap I was a little unsure about how the rest of the day was going to pan out. Unlike proper race circuits the “track” on an airfield day is marked out using cones. This can get quite confusing as from a distance a lot of cones look, just like a lot of cones so working out which ones to drive between or round while traveling at speed takes more thinking about than “just keeping on the black stuff”. Also an airfield has less than perfect “road” surfaces. Changing between tarmac & concrete and having to ride over tracks in the ground that military style gates run on! Being marked out by cones (and hay bales on some corners) also meant that drivers didn’t have the luxury of being able to clip the kerbs. Roll back to the Sunday before the airfield day and you would see the Merlot on axle stands with Jamie Tink and various other Eastern Region members mucking in to fit a set of Super Pro poly bushes(supplied by Performance 5) and front strut brace (supplied by Dandycars) at one of their bi annual Tech Days. With logistics arranged that would make a formula 1 team look amateurish the Merlot Motorsport team and a fast car managed to collect the car from Woolpit, put in an appearance and participate in the monthly meet drive from Ipswich to Bury St. Edmunds, get it to EMG Cambridge for a wheel alignment then end up at Woodbridge to put its new suspension components to the test. After warming the tyres up and tweaking the rear suspension damping rate after the first 2 sessions on the track the car set up was perfect for the conditions. Javelin had marked out a varied circuit with straights, tight 90 degree left and right hand bends, chicanes, sweeping bends and a fantastic “loop” that you could power round with great satisfaction. This was without a doubt Martins favorite part of the circuit, commenting on how well the car holds on around this part of the circuit and how he was determined to evoke a bit of controlled over steer. It was on Martins final session that I would be genuinely concerned about the safety of the car. OK, the loop area was a big expanse of concrete but it was surrounded by (also concrete) walls! I was first in the driving seat for the day and drove a steady 15 minutes getting a feel for the circuit and the car with its new suspension set up. As the tyres warmed up I was getting more and more confident but still being cautious around this uneven circuit. Ken was next out and there is photograp hic evidence of the left hand front wheel leaving the ground at some point during his run. Obviously, as usual our very own Mr. Ward was pushing it to the limit! Next out was Neil. Three members of Neil’s family were present at Woodbridge but they all seemed reluctant to take a passenger ride so I jumped in. (maybe I was nervous about letting the Merlot out of my sight – who says we’re getting to precious with it?). After his session Neil returned to the paddock having thoroughly enjoyed himself and I was heard to be telling his family members how smooth his driving was I thought he drove very well, if I didn’t know any better I would have said he’d been out on a track before. Martin clearly enjoyed his session judging by the amount of tyre squeal. This was an aspect of the day that Martin warmed to. He said “I feel out of place squealing the tyres too much on a proper circuit. 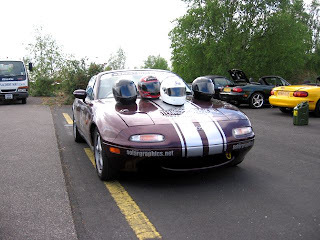 At an airfield it seems to be more about enjoying the car than getting in super fast lap times.” Up until lunch time the car and drivers had behaved. The only concern being a noise developing from the RHF wheel which a brake strip-down over lunch seemed to cure. On my second session I was clearly getting more confident in the car and the circuit, with Katie as passenger on the first left hander of my 5th lap I went into the corner too fast, lifted off through fear of understeer taking me straight on in to a hay bale and consequently induced oversteer. I managed to recover the slide & made a quick apology to Katie who said “No need to apologies, that was great can we do it again?” It was Ken’s turn. Had Katie known what tricks he had up his sleeve she would have paid to have taken a passenger ride with him this time. While being closely followed in the Merlot by a faster and more expensive Porsche Ken, maybe in sympathy for me took the first right hand corner too fast again forcing the car in to an oversteer situation. First the rear slid to the left impressively spinning 2 traffic cones video game style across the track, then after Kens counter steering efforts the car spun across the full width of the track and through 360 degrees causing the Porsche driver to brake hard and maybe, just maybe soil his pants! So the first track day wounds were etched into the paintwork of Project Merlot, small scraps on the left side from Ken’s encounter with the cones. Despite Martins determination to drift the car round the concrete loop on the last session of the day, a task he was unable to accomplish due to the “perfect handling of the car.” The rest of the event passed by with no more lasting memories other than those on camera and those great ones in the minds of the attendees. I found it a very different experience than driving on a proper racing circuit, but still loved it, a brilliant day out. Thanks to Javelin Trackdays who organise the event at Woodbridge, which I can highly recommend if you fancy some track action.